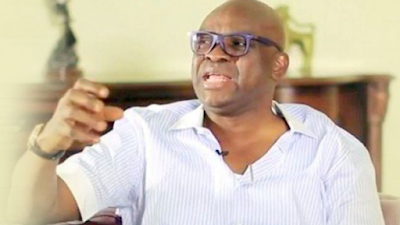 The Ekiti State Governor, Ayodele Fayose, has said it is too late for Nigeria to break up, calling for dialogue to resolve various agitations in the country. Fayose said this while reacting to Wednesday’s meeting the governors of the South-East states had with the leader of the Indigenous People of Biafra, Nnamdi Kanu. He said the meeting had provided a veritable platform, which all Igbo must key into otherwise they would remain guinea pig in Nigeria. Fayose blamed the actions and utterances of President Muhammadu Buhari for the agitations going on in the country. “The father figure of this country is President Buhari and if his language does not represent unity, there will be agitations like we are witnessing now. “A father figure rallies even the bad boys in his house. The utterances and actions of Buhari when he became President were against the unity of this country. “How can a president say that he will only attend to the needs of those who gave him 97 per cent vote and neglect others who didn’t vote for him? The governor commended the northern leaders for standing up to ensure that the Arewa youths’ quit notice against the Igbo in the North was resolved and withdrawn without necessarily arresting and detaining anyone. » Fayose Says That Only Igbo People Will Be Able To Survive If Nigeria Breaks Up.